Trump goes naked in statute, NYCPD pulls it down – Kenyatta University TV (KUTV). All Rights Reserved. People in New York, San Francisco, Los Angeles, Cleveland and Seattle were treated with rare entertainment when a certain group planted naked statute of Donald Trump in the named countries. The project dubbed “The Emperor Has No B—s,” was put on by a group called INDECLINE, according to The Washington Post. The artist, who goes by Ginger, previously designed monsters for haunted houses. 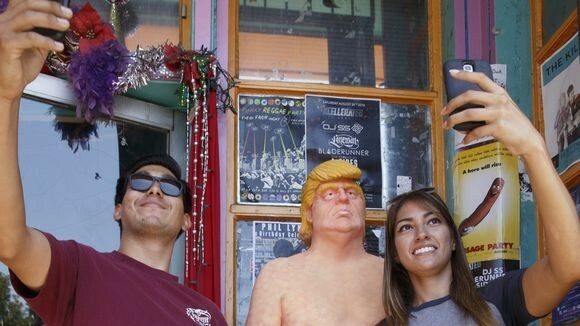 The New York City Parks Department issued a short response after INDECLINE hoisted a life-size, naked Trump statue in Union Square Park Thursday. “NYC Parks stands firmly against any unpermitted erection in city parks, no matter how small,” said Sam Biederman, a parks spokesman. Cleveland Police officers seized the statue that stood tall on the corner of busy Coventry Rd. and quickly impounded it. Police Chief Annette Mecklenburg said it violated a city ordinance.